Traditional craftsmanship, attention to detail. Handmade in Germany by Kosen using the finest materials. Polecat - any of several weasel-like carnivores of the family Mustelidae (which includes the weasel, mink, otter, and others). The pelt, especially of the European polecat, is called fitch in the fur trade. The European, or common, polecat, also called foul marten for its odor, occurs in woodlands of Eurasia and North Africa. It weighs 1�pounds and is 14� inches long exclusive of the bushy tail. Its long, coarse fur is brown above, black below, and marked with yellowish patches on the face. Much lighter fur distinguishes the masked, or steppe, polecat of Asia. Principally terrestrial, the polecat hunts at night, feeding on small mammals and birds. It also eats snakes, lizards, frogs, fishes, and eggs. The polecat is more powerful than the marten but less active, and it rarely climbs trees. Its litters of three to eight young are born in the spring after about two months' gestation. 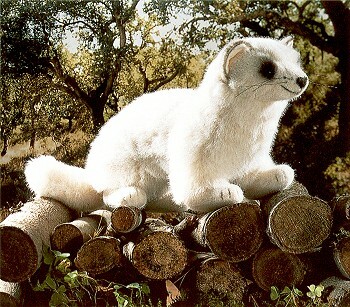 The domestic, albino variety of the European polecat is known as the ferret. "polecat." Encyclop鎑ia Britannica. 2006. Encyclop鎑ia Britannica Premium Service.